Since at this point in this Sew Along, I’m sure there are hardly any techniques or block approaches that need additional guidance, I decided, with the approval of Angie, to approach this tutorial a little differently. Today my tutorial will focus on “what next?” Now that this epic sew along is officially complete and you may or may not have all 99 of the blocks sewn, I will reflect on and share a few different approaches you might want to take. First, let’s get Flora’s construction covered. I foundation paper pieced my block, so for those of you who do not know how to foundation paper piece, visit my Basic Foundation Paper Piecing tutorial here, as well as the Foundation Paper Piecing tutorial guest post I wrote for the Andover Fabrics blog. Trust me, it is a technique worth practicing and mastering, since it opens a whole new world of sewing possibility! Since this block is not symmetrical, I printed a mirror image of the templates to help ensure I matched the color placement to that in the book. I selected simple dark, medium, and light green fabrics and carefully marked each piece of the template with a D (dark), M (medium), or L (light) before sewing so that once I had my fabric bits cut, I could chain piece the templates without too much thought. Those two preparatory steps (printing mirror image templates & marking each section of the templates) helped make the actual stitching of this block quick and smooth. The final block has been sewn! Congratulations! So now what….? If we reminisce back to October 2015 when we first began this sew along, I originally planned (hoped?) to make 72 blocks instead of the full 99. I planned to sew some with cool colors on a white/low volume background and warm colors on a grey/black background and set them with solid blocks between. It seemed like a solid plan at the time, back when I had in my head that I was making “just a little 6″ block every week”. As you all know at this point, though, these little 6″ blocks pack a punch, often with 30-60 pieces and taking hours to construct. I’ve accepted that the 72 block plan just isn’t in the cards for me at this point in my life. I’m totally ok with that. If you find yourself in the same boat, here are some options. One option is to keep plugging away at the blocks with the goal of completing all of them eventually. If you want to be sure to complete them in a timely fashion, you may want to set a new goal for yourself and try to hold yourself to it. Perhaps you could aim to make one block per week, at least 3 weeks out of every month. Or you could plan to make 1 block every 2 weeks, where week 1 is spent selecting fabric and cutting and week 2 is spent sewing the blocks together. If this is your choice, make a plan, write it down, and forge ahead! Adjusting the way you set your blocks could also help you get a decent sized quilt from the blocks you’ve made. 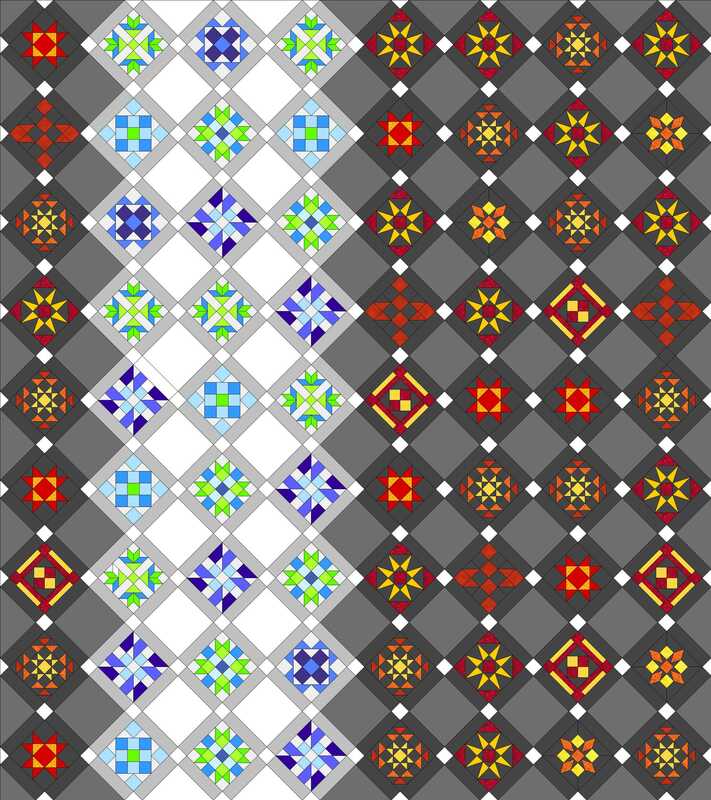 If you have made all 99 blocks, you could set your blocks with simple sashing and have a nice, huge quilt. Adding solid blocks between each Farmer’s Wife block can help you get the most bang for your buck with however many (or few, in my case) blocks you’ve made. Add sashing and that will make your quilt even larger relative to the number of blocks you’ve made. My original mock-up includes both the blocks between each Farmer’s Wife block, and sashing, so you can reference that (included a few images up) for a visual. Or you could think even further out of the box and arrange your blocks in a more modern, negative-space filled setting. 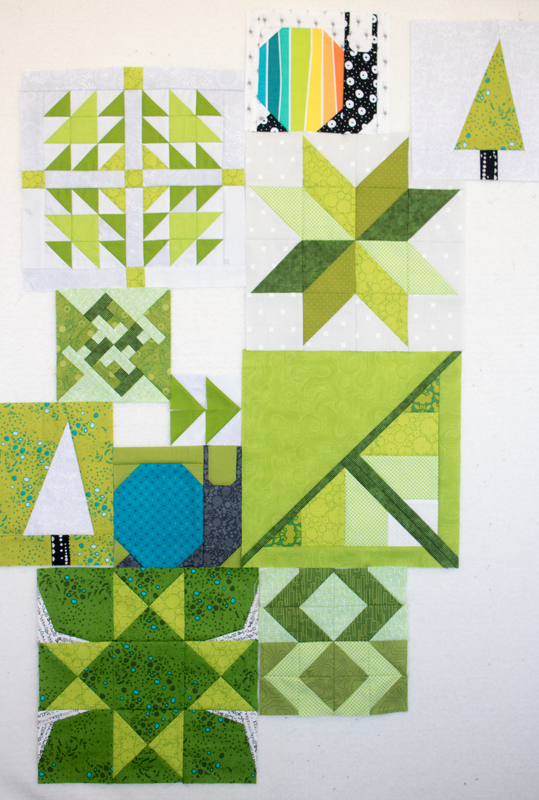 I love the idea of arranging blocks similar to the design in Alyssa Lichner’s Concerto Quilt pattern for Aria Lane! 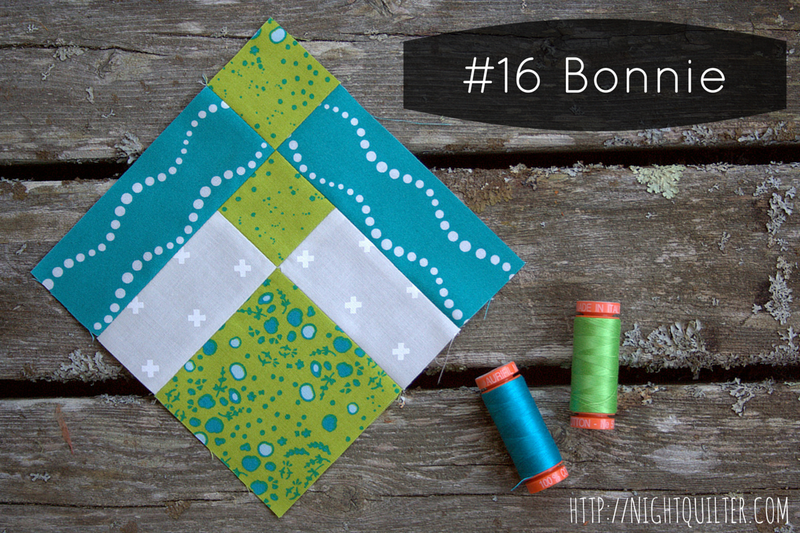 If you made less blocks than you initially had planned, you could always make a smaller quilt! Lap quilts are all the rage these days, right!? Are any of your local farmer friends having a baby anytime soon? A good handful of these blocks could be beautifully worked into a “Farmer’s Baby Quilt”. 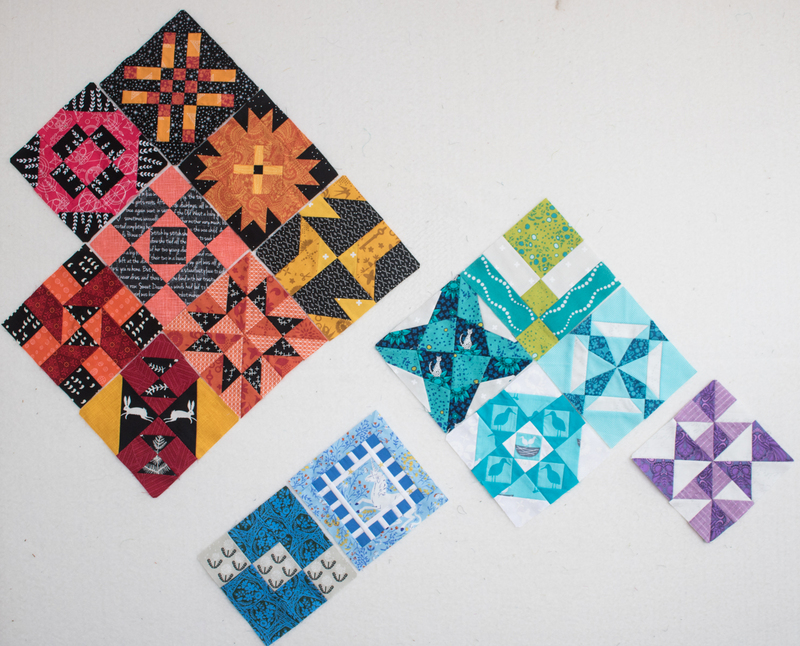 With these intricate blocks, you don’t need many of them to make a gorgeous quilt. If, like me, these 6″ blocks showed you who’s boss (and it wasn’t you) and you only ended up successfully making a bit over a dozen of them, they sure would make beautiful placemats or pillows! Both placemats and pillows are handmade items that are often seen and appreciated daily, making sure your painstaking efforts will be appreciated to their fullest. 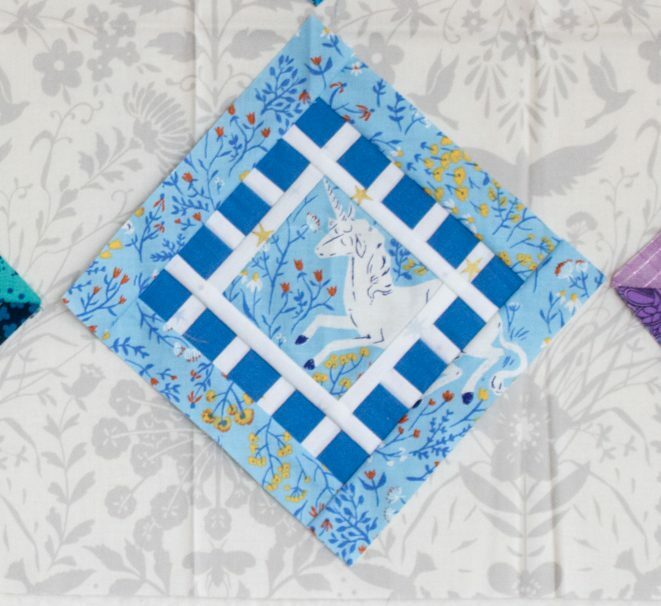 I’m actually thinking the blue unicorn block I made very well might have to become a pillow for one of my kiddos. It will surely be cherished that way. With all of those options on your plate, your beautiful Farmer’s Wife blocks are sure to find their way into a finished work of beauty instead of floundering in a pile in your sewing space, right?! Choose your own adventure, enjoy the journey, and thanks so much for joining in on this wild Farmer’s Wife Sew Along experience! So which adventure will I choose? Once I completed Flora, I pulled out all of my completed blocks and put them up on my design wall to take stock of my progress. As seen above, I finished a whopping 16 blocks. I am not counting the three blocks that have foundation paper piecing templates printed, cut out, and fabric pulled, since they are not yet sewn, but I do plan to make them eventually. At first I considered the “Make a Smaller Quilt” option, and thought perhaps I’ll make a few more blocks to fill out a lap sized quilt in my original layout. Note that these photos are from a purely planning phase–fabric slapped up onto my portable design wall simply for the benefit of playing with different arrangements visually. It’s wrinkled and wonky and that’s all part of the fun! Since I made the warm colored blocks with a dark background and the cool colored blocks with a white background, I probably will stick with those for sashing and background blocks. Once I began writing this post, though, the negative-space filled setting inspired by the Concerto Quilt is really calling to me. 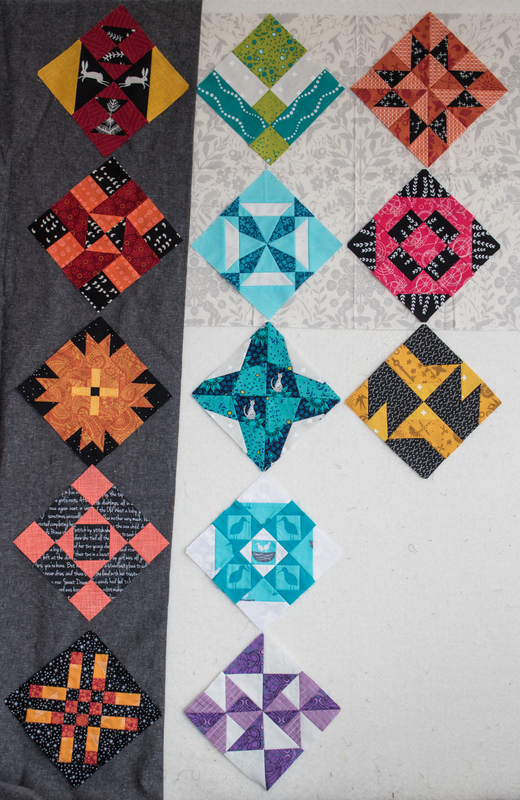 I may opt to plug away and make some more blocks, with the end goal of setting them in a fade out pattern similar to the blocks in the Concerto Quilt. Time will tell, and since I know that I want to make more blocks before settling on any of the options, it’s absolutely okay to choose later! 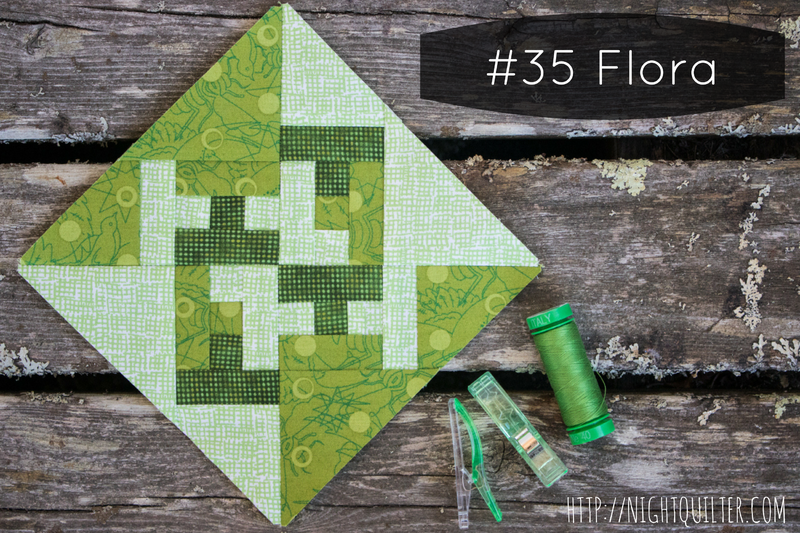 Flora is going to go live in my Greenery 2017 quilt, though, since the block reminded me strongly of dappled light through the treetops and I thought adding a Farmer’s Wife block to my year’s Greenery project would be the perfect touch! The quilt is already a green melting pot of blocks from all of the sew alongs and bees I’m joining this year so it feels only right that a Farmer’s Wife 1930s block join the ranks. The moral of this story is: There are no rules. This is your quilt. You can do anything you want to with these blocks! Enjoy the adventure! All the block tutorials by Angie and bloggers. FAQs for the sew along. 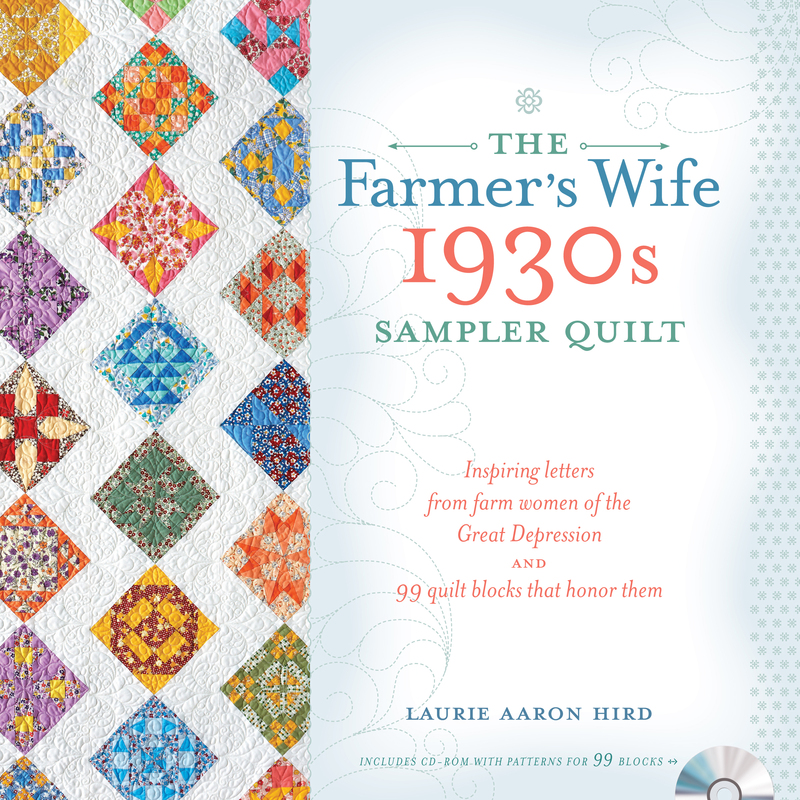 The Farmer’s Wife 1930s Sampler Quilt: Inspiring Letters from Farm Women of the Great Depression and 99 Quilt Blocks That Honor Them by Laurie Aaron Hird for Fons & Porter/F+W; RRP $28.99 – Click here to purchase. Ahh, remember the Farmer’s Wife Sew Along!? 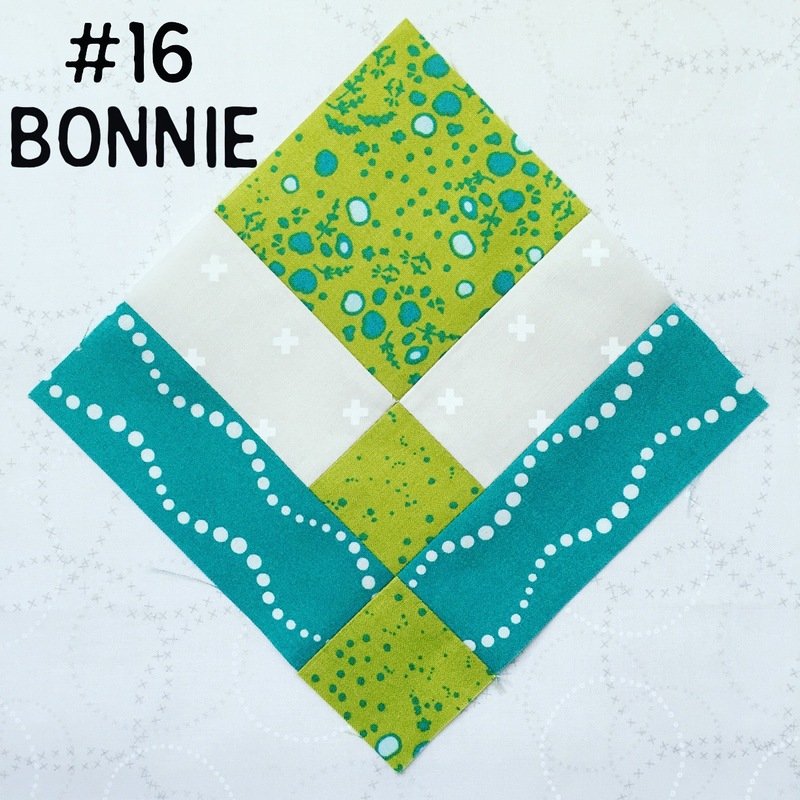 Today is my day to share the Block 95 Sylvia tutorial for the 1930 Farmer’s Wife Sew Along, hosted by Angie at Gnome Angel and sponsored by Fat Quarter Shop and Marti Michell. Sure, I’m wildly behind on this sew along, but that’s totally ok! With my final deadlines being met within the next couple of weeks, I will have time to catch up a bit, chipping away at the missing blocks here and there. It’s all good! That’s part of what I love about Angie’s Sew Along–there’s no pressure. I’m making this quilt for me and I can take as long as I want to finish it! all of the border pieces can be cut using a rotary cutter and ruler to decrease the paper removal at the end. 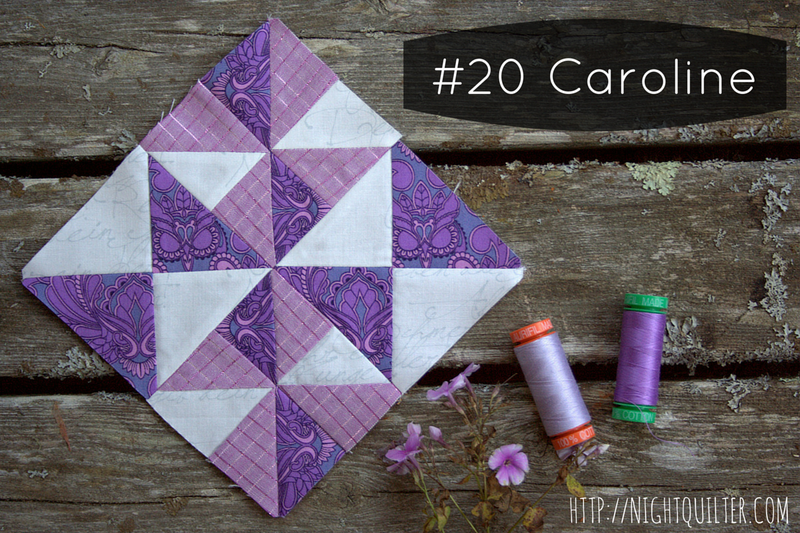 Those who know me know that I LOVE foundation paper piecing (FPP), and it’s true–I do! The precision one can get using FPP is unrivaled, and once the technique is mastered, it makes sewing teeny tiny pieces MUCH more manageable. I am not going to take you step by step through how to foundation paper piece, since I have written two very clear tutorials already (why reinvent the wheel, right!? ), but I will share some block-specific tips and tricks to help you piece Sylvia smoothly. For those of you who do not know how to foundation paper piece, visit my Basic Foundation Paper Piecing tutorial here, as well as the Foundation Paper Piecing tutorial guest post I wrote for the Andover Fabrics blog here. Trust me, it is a technique worth practicing and mastering, since it opens a whole new world of sewing possibility! Nearly every one of the letters in this book seems to talk to me in a very specific, seemingly personal way. After the first dozen times of reading a letter I shockingly thought was *meant for me*, I realized that all of the letters have a very widely applicable message and I was simply interpreting it in a way that worked for me at that moment. That said, I can completely relate to this letter!! Sometimes it’s necessary to just head off on an adventure despite whatever chores, obligations, or need for frugality you have waiting for you at home. We did a lot of adventuring this summer, but like Mrs. A. M. from the letter, we were able to do it on a very tight budget, not paying for much more than gas money. Day trips to beaches, mountains, playgrounds, and forested hikes abounded, and I was always sure to pack a picnic lunch, extra snacks from home, and full changes of clothes for all three kids (and myself)… just in case. It was a much needed change from the stay home and do chores days we could have had! Ready to get sewing? Make sure you have a grasp on how to foundation paper piece, and let’s make Sylvia! As soon as I saw this block, I knew that I wanted to meticulously cut the center square. I’m arranging my blocks on point, so be mindful of your own plans before meticulously cutting your fabric! (I call “fussy cutting” meticulous cutting, and you can read why here). In looking for a fabric with a perfect color scheme and feature design, I stumbled across my precious Heather Ross Far Far Away unicorns (Windham Fabrics). I added some solid blue from an old project, and some Lizzy House Twinkle Twinkle from her Whisper Palette (Andover Fabrics). While the colors are a bit more muted than my other blocks, I think they will all work together. Plus, this fabric combination was a match made in heaven… once it was together, there was no separating it! Foundation paper piecing results in many trimmed thread ends. What better time to make yourself a thread catcher? Here’s a free tutorial on how to make the one I use. To help you while you stitch up Sylvia, here are some block-specific tips for you with photos from my process. 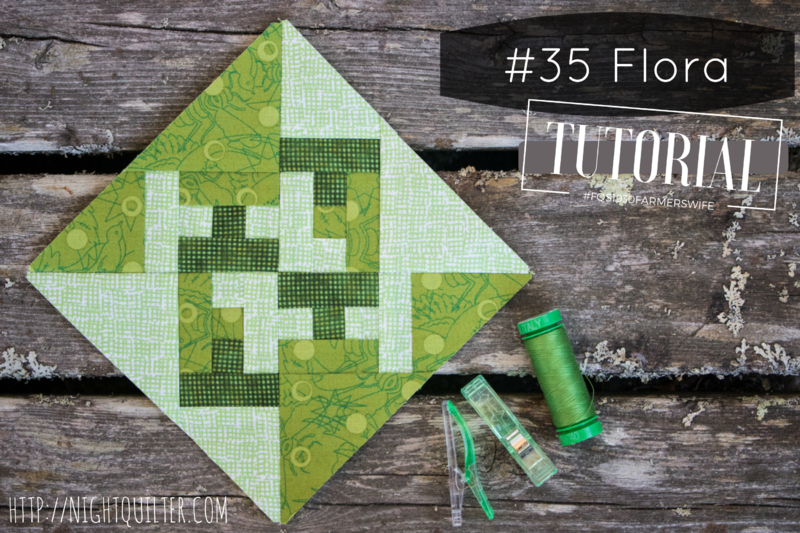 Fussy cutting while foundation paper piecing can seem daunting, but with one extra step, it can be super easy! Simply create a fussy cutting planning template for the piece(s) you want to focus on. I go through making such template in detail in my FPP post for Andover here, but here are the basics: Print an extra sheet of paper containing the FPP template with the piece you want to fussy cut (printing on card stock will make the planning template sturdier). Mark the specific piece you want to meticulously cut. I went a little overboard on marking mine for the sake of clarity here. I circled the number but also traced just outside the line of the particular piece, both with bright pink sharpie. Simply circling the number would probably suffice! Cut out the center of the piece, creating a window that is exactly the size of the piece you want. Draw a 3/8″ seam allowance around the window. I used a green micron pen for this example to ensure the line didn’t get confused with the printed lines on the paper. Cut along the line you drew. You should how have a planning template to help you cut your fabric for fussy cutting. Notice that I placed my planning template onto the fabric upside down. This is because in foundation paper piecing, we are sewing the block on the reverse side of the template. It did not matter too much for this particular piece, since it’s a square, but always be mindful of directionality of the fabric as well as wrong side-right side. If need be, mark your planning template with “right side up” or “wrong side up” so that your fabric is cut properly! Between sewing the fabric on the reverse side of the paper, having the block broken into sometimes odd sections before sewing, and the many pieces involved in most foundation paper piecing patterns, it is in your best interest to color code your paper template before beginning to sew. This way, you can be sure you sew each fabric in the proper place. Especially when first getting started with foundation paper piecing, one of the biggest tips I can offer is to be generous with your fabric pieces. It’s better to have to trim a bit more off than to be short and have to rip stitches! For my bright blue squares on Sylvia, I cut the fabric into 1 1/2″ squares, which as you can see includes ample overhang. This tip goes for bag-making as well: just because there is a template created for a perfectly rectangular piece, it doesn’t mean you can’t use your rotary cutter and ruler! The outer pieces of Sylvia can be easily cut using a rotary cutter and ruler, which will save time with paper removal at the end. Since these pieces are not easily measured (let’s avoid using sixteenths of an inch if we can help it!) simply cut out the foundation paper piece templates and use them as a guide when rotary cutting. Use the foundation paper piecing method to piece the center portion, then add the D, E, H, and I rectangles using traditional piecing methods. Easy peasy! And there you have it. Sylvia, in all her glory. Thank you so much for joining me today and I hope you found this tutorial helpful! It has been a long while since I last shared an update on my 1930’s Farmer’s Wife quilt progress. I wish I could say it’s been because I’ve been too busy stitching them up to post photos, but…. you know the truth. I haven’t made much progress. You know what, though? That’s ok! I have been creating all sorts of everything, and the whole idea behind this sew-along is to have fun. I’m still excited about my color scheme and warm-cool layout plan, and I plan to get back on the wagon with making slow progress on the blocks. Since my last post, I’ve made two whole 6″ blocks. Yay, progress! Both blocks are in cool-on-white colors, since in looking at my blocks thus far, I decided I needed to build my cool collection. 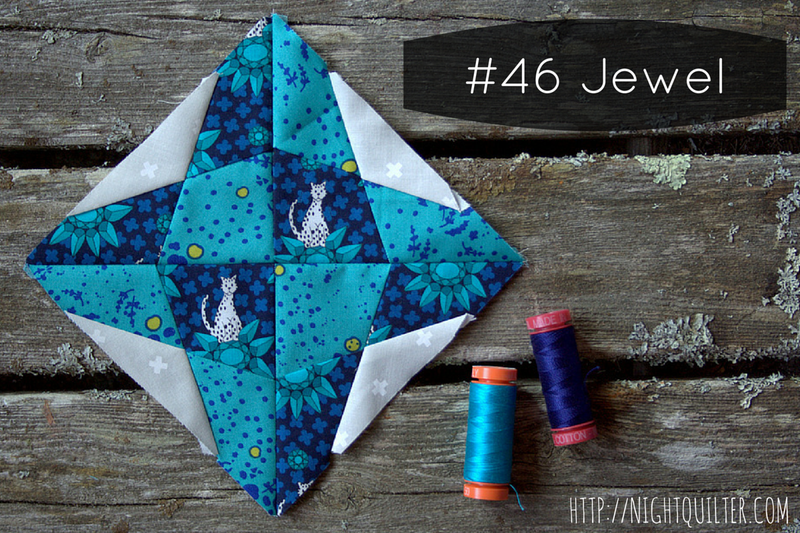 Jewel is the first block I foundation paper pieced, and you know me–I LOVE foundation paper piecing! As straightforward as she looks, I think I struggled with Jewel the most out of any of the blocks I’ve made thus far. Between the mirror image fabric placements and the tough angles, this block is a bit ragged around the edges. I’m living with it though, and I think it should be hidden within the seam allowances eventually. This block also will act as a bit of a tie between the true blue blocks and more turquoise blocks. I am still on the fence as to how I will ultimately arrange the blocks within the cool-warm areas, but I think as I make more blocks, a cohesive plan will arise. It nearly always does, right? Mrs. Brown was very fun to make. I used some precious scraps and had some fun with meticulous cutting to get those parent birds to gather around the nesting babes. I know these blocks measure a measly 6″ square when finished, but they sure do pack a lot of punch! I’m currently finishing up a big project and a few small ones, and then I plan on setting the month of April aside for selfish sewing since it’s my birthday month. Part of my selfish sewing will include cranking out a few more of these 1930s Farmer’s Wife blocks (I hope!) 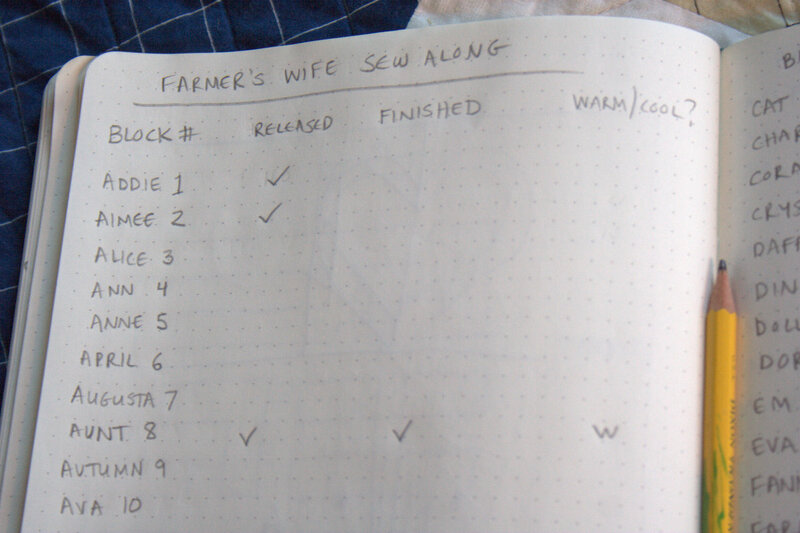 An exciting update about the Farmer’s Wife Sew Along was recently announced, and should help my catch-up goal tremendously. The amazing Angie from Gnome Angel, who has been hosting this epic world-wide sew along with over 7,000 members (!!! ), has decided to switch to releasing one block per week instead of two. It turns out she’s only human, too! It is reassuring to hear that I’m not the only one feeling like these sweet little 6″ blocks are not something to be taken lightly (nor something to be sewn up in any kind of record time). I’m extending my promise from last time one more post–next time I post an update about my Farmer’s Wife progress, I’ll show you all of the blocks! Hold me to it! 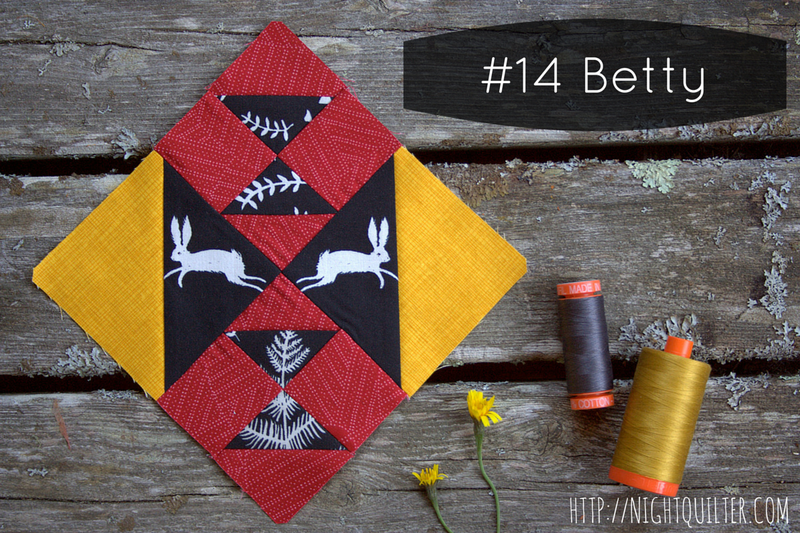 I’m linking up with Let’s Bee Social over at Sew Fresh Quilts. 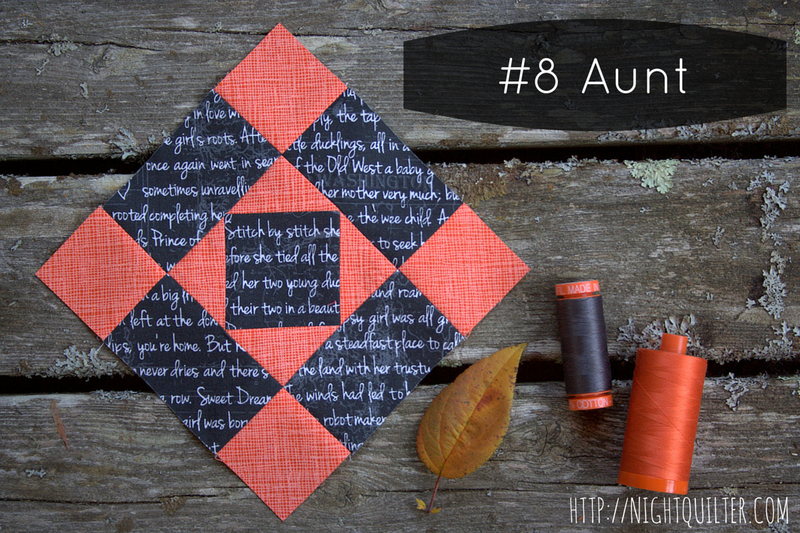 Today is my day to share the Block 9 Autumn tutorial for the 1930 Farmer’s Wife Sew Along, hosted by Angie at Gnome Angel and sponsored by Fat Quarter Shop and Marti Michell. 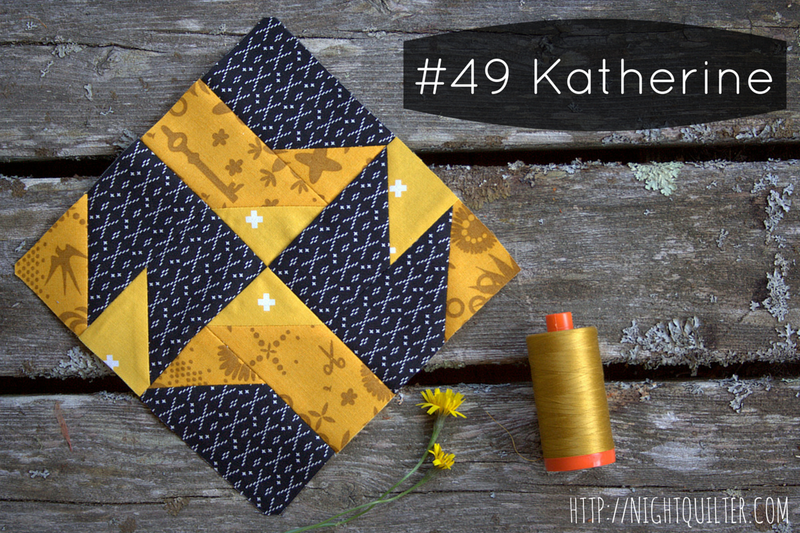 With a block like Autumn, it’s easy to get daunted before you even begin: 37 pieces in one 6″ block!? Ack! But wait! This is a perfect time to practice looking at each block’s construction creatively. If there’s one thing this sew along has taught me, it’s that there is nearly always a faster and easier way to approach block construction than purely cutting out all of the pieces and sewing them together. With a few shortcuts and piecing tricks, Autumn comes together quite smoothly. 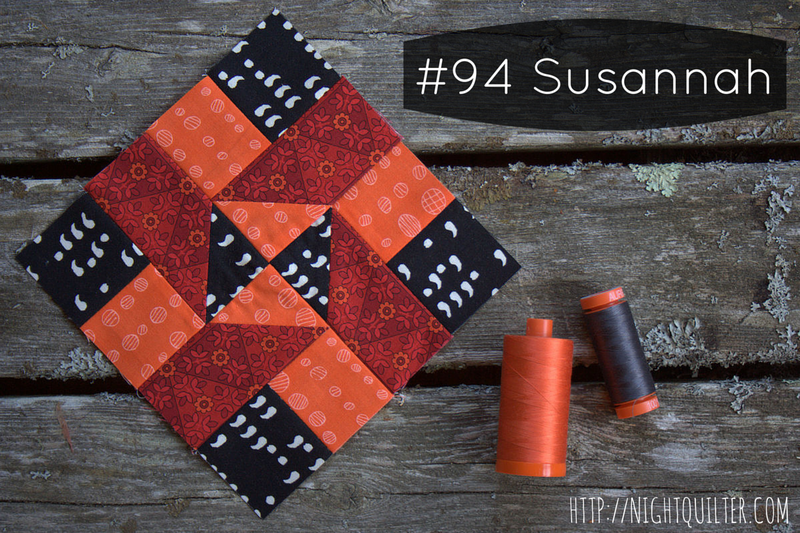 In this tutorial, I’ll show you how to make half square triangles (HST) 8 at a time (Yes, 8! We make all of the HST needed in this block at once), use strip piecing to save a bit of time, and fill in the gaps using Marti Michell templates (Set B and Set N are helpful with this block) or rotary cutting to help make putting Autumn together as easy as watching falling leaves. 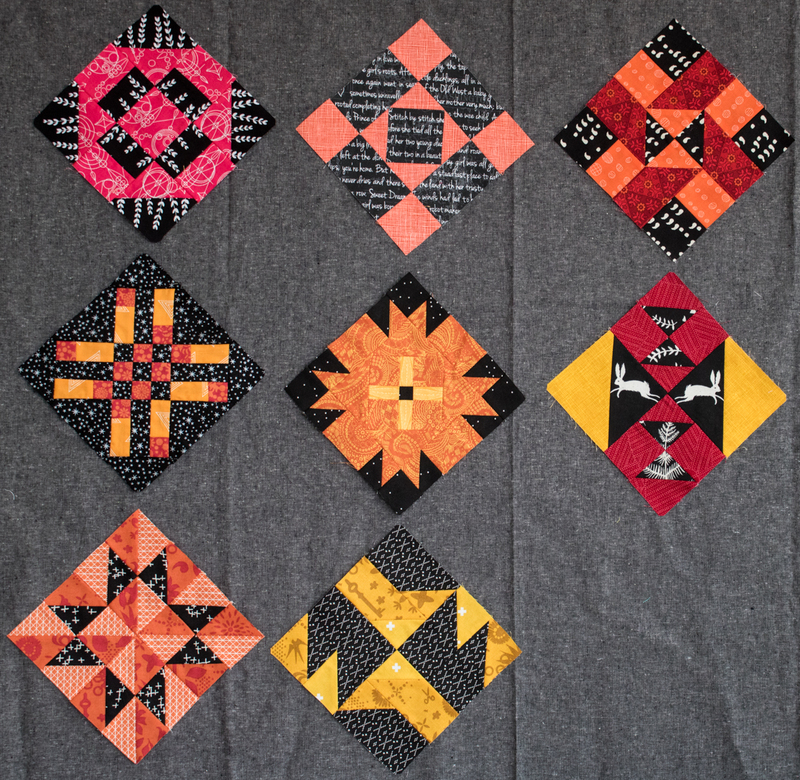 As you may have noticed, I used different locations for the orange and black fabrics in the center square than those used in the book. I’d like to say it was intentional, but lo… it was not. I did not even realize my error until this entire tutorial was finished, photographed, and scheduled to post, as I was proudly admiring my block. When I realized my error, at first horror swept over me. Then, after Angie’s reassurance and another look at my block, I decided that Autumn was a good place for a design change. After all, it’s my quilt! 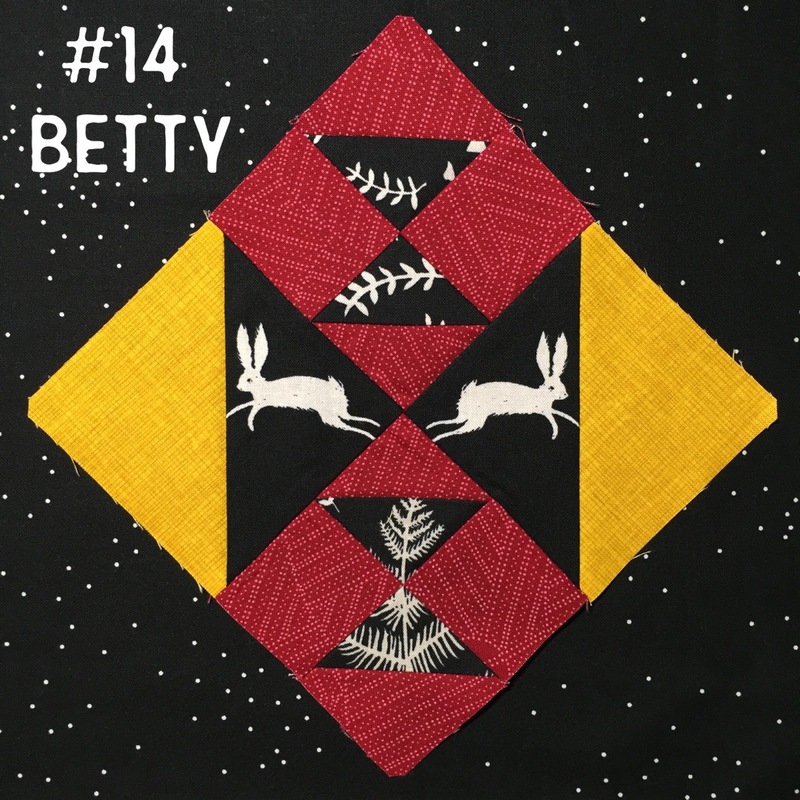 I encourage you to remember that during this sew along, and don’t be afraid to make your quilt your own, with a hefty dose of gentleness toward yourself if when you discover an error after fully completing a block. Call it an unexpected design element. AND take this as an extra reminder to double check your fabric placement and choices BEFORE sewing your block together! Note: Exact measurements for the pieces needed to construct this block will not be provided in this tutorial in order to protect copy write. 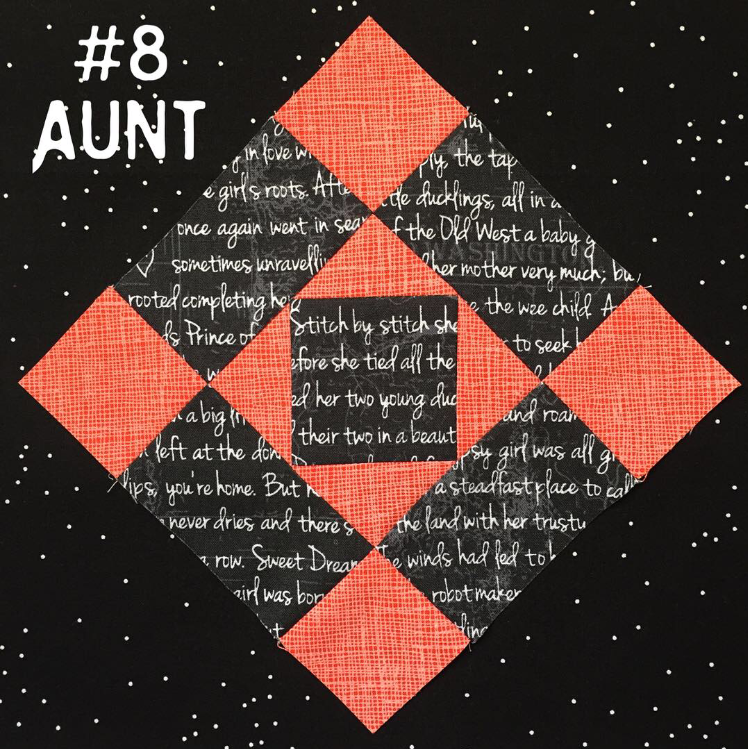 It is a prerequisite of making this block that you have a copy of the book, The Farmer’s Wife 1930s Sampler Quilt: Inspiring Letters from Farm Women of the Great Depression and 99 Quilt Blocks That Honor Them. All measurements can be found in this book and its associated media. That said, even if you aren’t sewing along with us, I think you will find some really helpful tips in this tutorial that will help you look at all block construction more creatively! For those of you reading this who are not sewing along, one of my favorite aspects of this sew along is that each block in the book is inspired and accompanied by a letter written by an actual 1930 farmer’s wife. It has been inspiring to see how similar these farmer’s wives’ dreams, desires, troubles, and day-to-day struggles were to mine, and to hear their often uplifting takes on life. I can’t tell you how many times I’ve read the letter with tears in my eyes, nodding a resounding “yes!” as I relate my own life to the words on the page. I know Angie said that blocks were allocated completely randomly, but this letter was meant for me. This woman is me! It was both surreal and somehow encouraging to read that even those hard working, ever-positive farmer’s wives embraced the NEED to make time for themselves. A few months ago, I created a hashtag (#sewtake20) in an attempt to encourage other busy moms (and myself!) to make time for themselves 20 minutes a day, no matter how crazy the day, how high the stack of dishes, and how all-engulfing the mountain of laundry. Wise L.O.L. from Iowa recognized the need to nourish body and soul back in 1939, despite her full plate. While she took a precious half hour and I’m striving for only 20 minutes, it still helps me to not feel so guilty doing the same here in 2015. For this block, I specifically chose fabrics with small or nondirectional prints, so that I could quickly piece the components without worrying about fussy cutting or directionality. The #9C pieces are a small exception, since I gave a tiny bit of focus to fabric alignment. Note that I am arranging my final layout on-point, but for the purposes of being consistent with the diagram in the book, this tutorial pieces the block squared. If you plan to set your blocks on-point, be sure to account for that with any directional fabric placement. This block is composed of 8 HSTs, 8 rectangles, 9 squares, and 4 triangles. I first cranked out the bits I could make quickly and efficiently, namely the HSTs and the center square. Let’s break it down. In the book, the print and coral fabrics were used to make the #9F HSTs. Choose your coordinating fabrics (I used black and orange). Cut one (1) 5″ square from each. Note: If your HST-making skills are on point and you want to conserve fabric, you can use 4 3/4″ squares. I prefer to play it safe and trim a bit more to ensure my HSTs are perfect. Right sides together, draw diagonal lines from corner to corner, making an X. You only need to mark the wrong side of one of the squares. Pin your squares together to keep them from shifting, and sew 1/4″ from the right and left of both lines. This is a good time to confirm the accuracy of your 1/4″ seams. Carefully draw a line down the middle of the blocks in both directions. I used the 2 1/2″ line on my ruler to help make sure my line was square. You should now see a plus and an X. Cut along the marked lines. Press open. You now have 8 HSTs! I typically press all seams open, but with HSTs I press to the darker fabric since I use my Bloc Loc rulers to trim them to size. If you don’t have Bloc Loc rulers, feel free to press seams open, and align the 45 degree line on your ruler to help trim to the size indicated on the #9F template in the book. 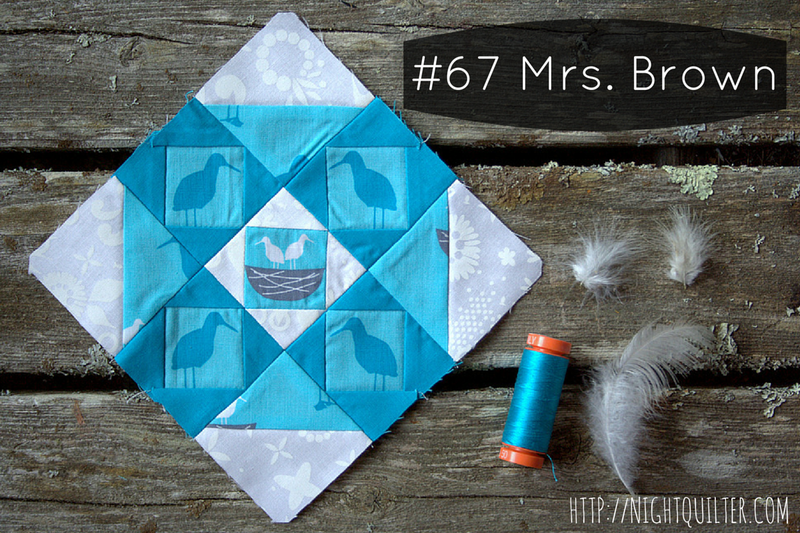 You can also use Marti Michell template N79 to trim to square, too. Be sure to center your diagonal seam in the centers of the two holes in the template to trim evenly. Do a little dance and set those 8 HSTs aside. Because the center square is symmetrical, two of the outer edges can be strip pieced, saving you a bit of time and thread. In the book, the coral (#9D) and yellow (#9G) fabrics with a tiny center square of print (#9E) were used. I should have used black, yellow-orange, and a tiny center square of orange, but as I noted above, I made an inadvertent design change and went with orange, yellow-orange, and a tiny center square of black. Wrap your brain around which of your fabrics belong where for your block, and here we go. **Really, take a moment and make doubly sure you have the right fabrics. Got it? Great! We will be strip piecing the two rectangles composed of #9G and #9D. Right sides facing, sew the #9D rectangles to the center #9G along each long side. Cut in half as shown to create two (2) 1 5/8″ x 3 1/4″ rectangles. We will call these your #9DG units. Using the rotary cutting measurements provided in the book’s cd, cut two (2) #9Gs and one (1) #9E. Assemble as shown. Note that I rotated the bottom row 180 degrees so that the direction of the yellow-orange fabric radiates outward from the center. 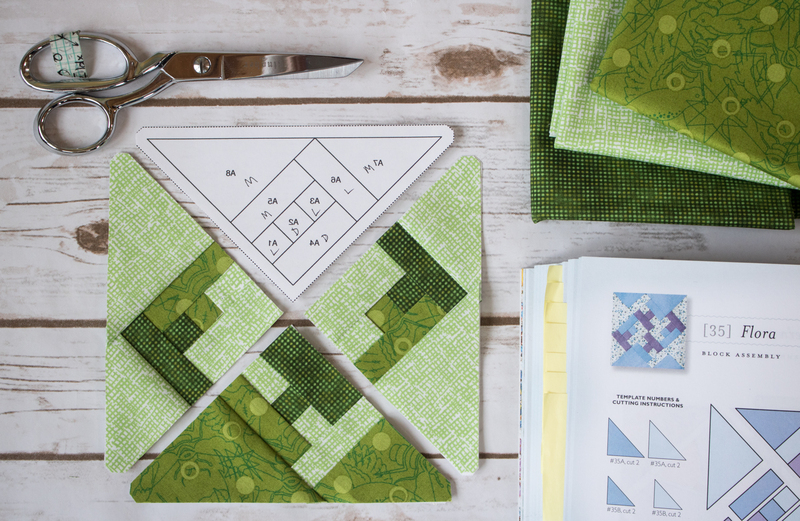 Sew your strip pieced #9GD units to the top and bottom of your center piece to create the center square. Sewing Tip: When matching seams, pin directly after the seam join to prevent slipping. Also, take a moment to match up the seam lines on the opposite raw edges, too. While it is not a sewn edge, it will help keep the sewn edge level. Cut a 1 1/2″ x 6″ strip of your coral-equivalent fabric (I used black). Subcut the four #9D squares, per the measurements provided in the rotary cutting instructions or with Marti Michell template N79. Cut a 1 1/2″ x 10″ strip of your print-equivalent fabric (I used orange). Subcut the four #9C rectangles, per the measurements provided in the rotary cutting instructions. Cut a 2 1/2″ x 7″ strip of your print-equivalent fabric (I used orange). Using Marti Michell template B13, subcut four (4) #9A triangles. If you don’t have the Marti Michell templates, you can use the rotary cutting dimensions or paper templates provided on the book’s accompanying CD. Now that you have all of the necessary components, lay them out to make sure you have all of the pieces aligned properly (pay particular attention to those sneaky HSTs). Tip: Take the time here to focus and be sure that all of the pieces are arranged properly, heavily referencing the picture in the book. The HSTs are particularly sneaky. Once your block is perfect, take a picture with your phone and reference it heavily throughout the piecing process. It takes less time to stop and lay out your pieces to check the arrangement than it does to seam rip once you’re finished! First, sew the #9A triangles to the center square as shown. Begin with two opposite sides. Press seams open. Sew on the remaining two triangles. Press seams open. Your center square should now measure 4 1/2″ including seam allowances. Pair corner #9B squares with their neighboring HSTs and sew as shown. I like to chain piece steps like this, and as I pick up my pairs of squares to sew, I align all of the to-be-sewn edges so that I don’t get mixed up between my cutting/arranging table and the sewing machine. Sew HST-corner square units to center #9C rectangles to create the top and bottom rows. Next we will sew the middle row together. Sew the HSTs to the side #9C rectangles as shown. Again, pay close attention to the alignment of those HSTs! They like to do somersaults on the trip to the sewing machine if you’re not super careful! Sew side HST-rectangle units to center square. Sew top and bottom rows to the center row. Tip: This is another great place to match bottom seam lines as well as those right at the sewn raw edge. There are only two seams to match! I love this block! Press all seams open. Thank you so much for joining me today and I hope you found this tutorial helpful! This is the last tutorial before the Christmas break, which begins tomorrow and lasts through the first week in January. I know I am hoping to do some serious Farmer’s Wife catch-up amongst all of the festivities. Merry Christmas, happy holidays, and a very happy New Year to you all! Despite all my best intentions, life has caused me to get a *bit* behind with the 1930 Farmer’s Wife Sew Along, hosted by Angie at Gnome Angel and sponsored by Fat Quarter Shop and Marti Michell. I’m not letting it get me down, though, and plan to keep on plodding. After all, not only have I allotted for skipping some blocks with my planned layout, I also know that every block made is one step closer to catching up. It’s all about patience, right? Here are my latest three block additions. It’s all about patience… see what I did there? If only patience were always so easy to come by! I am really liking my color choices, and as more blocks are added, I’m starting to see how they might go together. I’m still toying with arranging each warm-cool grouping in color order, and very well might do so. I think after the next bout of blocks added, I’ll try laying it all out together and see what you think, too. I’m linking up with Freshly Pieced’s Work in Progress Wednesday, and Angie’s Farmer’s Wife Link Up. Have a great day! As this crazy month of November winds down (already!? ), I’m trying to get a bit organized with my sewing projects. I truly enjoy having a lot of projects going, and I’m excited about all of the different quilting adventures I’ve joined lately (mini mini quilt swaps, Sizzix Design Team, a small private swap, my first commissioned quilt, and the Farmer’s Wife Sew Along as an official blogger, among others I’m surely missing). But life happens, and when it does, it can certainly throw a wrench into best laid plans. Yesterday I decided it was time to reevaluate, make some lists, and wrap my head around a plan for creating with little stress. First up is the 1930 Farmer’s Wife Sew Along, hosted by Angie at Gnome Angel and sponsored by Fat Quarter Shop and Marti Michell. As you may remember, in planning my quilt, I literally planned to be behind and to skip a few blocks so that I could sew along without stressing about being behind. After a crazy month of travel, visitors, and sickness all around, I may have taken that “it’s ok to be behind” a bit too far. I made myself a comprehensive list complete with a space to check off when a block has been released or made. 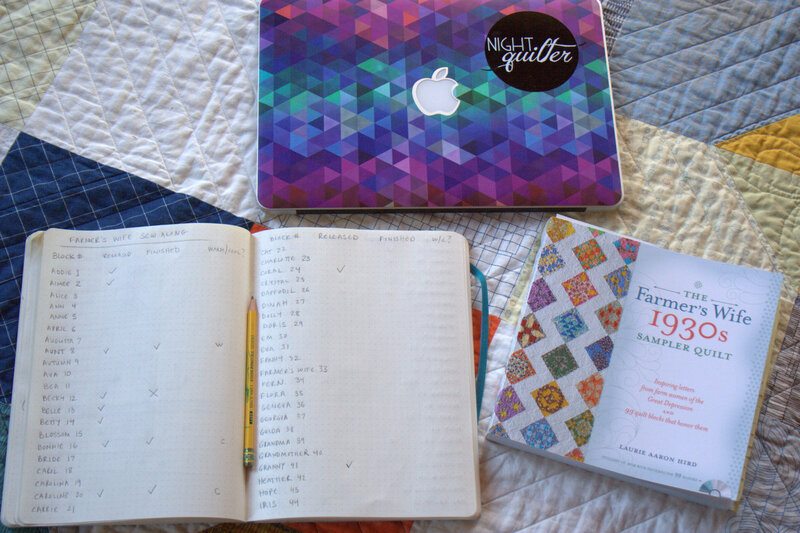 I LOVE checking things off a list, so I am hoping this is just what I need to catch up a bit. I also put post-its on the pages of blocks that have been released so that when I have a free minute, I can easily flip to one, grab some fabric, and dive in. My mind is much more at rest knowing that everything is written down and ready to check off. Now, for the fun update! Here are the blocks I’ve created so far. I’ve decided on a photographing style, organized my notes, made a checklist of released vs finished blocks, bookmarked pages with blocks I need to make, and am reenergized and ready to do some catching up! I’m linking up with Lee’s Works in Progress Wednesday at Freshly Pieced. These “easy 6-inch blocks” (insert maniacal laugh) will be works in progress all year! Online Sale – This is their big online sale for the holidays! Take 15% off online starting Thanksgiving Day through Monday, November 30th. Please use the code “Thanks2015” to receive a 15% discount on your entire order (before shipping) anytime over those five days. In-Store Sale – For those of you in the Belfast, Maine area, Fiddlehead Artisan Supply is also having in-store sales during this long holiday weekend, AND an early bird special sale day on Saturday December 5th. Check them out! We are now two weeks into the year-long 1930s Farmer’s Wife Sew Along hosted by Angie at Gnome Angel and sponsored by Fat Quarter Shop and Marti Michell. I’m a block behind already, but it’s okay. No, seriously, I planned for this. At this point in my life, I have learned to actually PLAN for being behind schedule. (Is that weird or just really resourceful? I haven’t decided yet). The final layout and block setting I chose/created includes background blocks between the farmer’s wife blocks, so my finished quilt only needs 72 blocks instead of the full 99. This gives me some much needed wiggle room and a whole lot less stress when I’m running “behind”. No worries. This is fun! I’m having a great time so far experimenting with warm and cool color combinations as I put together the 6″ blocks. Here are the ones I have completed so far. For photos, I’m backing the warm colors with the black fabric in which they will be sashed, and the cool colors in a white/low volume print. I may swap a more grey-silver fabric in as sashing in the final quilt construction. Time will tell. As you can see, I’ve been inspired by the gorgeous blocks being made by other quilters, especially the fun use of meticulous cutting. While I don’t have many “fussy cut”-able tone on tone fabrics, you can be sure you’ll be seeing more meticulous cutting in future blocks wherever I can make it work. It’s so much fun! Reading the letters that correspond to each block has been my favorite part. The determined spirit of the farmer’s wives in the 1930s is inspiring and really puts things into perspective. While my block sewing has not been as reflective and relaxing as I imagined (shocker), I am enjoying this journey. The only requirement for this sew-along is that you have the book by Laurie Aaron Hird, since the block measurements, directions, and templates are all included only in the book. There is also now an ebook available, which makes it super easy to jump right in. I’m linking up with Angie’s Farmer’s Wife 1930 Sew Along Link up, week 2. I encourage you to hop over and see all of the gorgeously diverse blocks that have been made so far. It’s amazing how each person’s personal style and tastes can be put into the very same block! You can also visit the extremely active and growing Facebook group, which is now over 4,000 strong! I’m looking forward to making more of these blocks, and reading more inspiring reflections by the farmer’s wives of the 1930s.